This mosaic image is a combination of data collected from New Horizons' Long-Range Reconnaissance Imager (LORRI) and the Multispectral Visible Imaging Camera. On the two-year anniversary of the New Horizons probe's flyby of Pluto, mission scientists unveiled two detailed global maps of the dwarf planet and its largest moon, Charon. The combined data can now give the public insight about the mountains, volcanoes and canyons of these distant celestial neighbors. "The complexity of the Pluto system — from its geology to its satellite system to its atmosphere — has been beyond our wildest imagination," Alan Stern, New Horizons principal investigator from the Southwest Research Institute in Boulder, Colorado, said in a statement. The data New Horizons collected during its encounter with Pluto on July 14, 2015 continues to reveal more secrets about the dwarf planet, according to the release. In July 2015, the New Horizons spacecraft took the first close observations of Pluto and Charon, which later became these maps. New Horizons' scientists used a technique that accounted for how something appears when photographed from different places. The phenomena, also known as parallax, allowed scientists to determine how elevated or sunken the features imaged by their Long-Range Reconnaissance Imager (LORRI) on New Horizons were. The probe's Multispectral Visible Imaging Camera measured elevations that appear in the photographs as assorted colors. Some of the features shown on the map are the icy plains of Pluto's Sputnik Planitia and the ridges of Tartarus Dorsa. 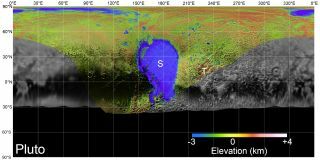 The new maps show that the former ninth planet of the solar system is home to cryovolcanoes, or ice volcanoes, as well as mountain peaks, craters and canyons. Pluto's largest moon, Charon, is also dotted with craters and overlaid with expansive plains. The New Horizons spacecraft continues to send data back to Earth, from which composite maps such as this one of Pluto's largest moon, Charon, can be formed. "Everywhere we turn are new mysteries," Stern said. "These new maps from the landmark exploration of Pluto by NASA's New Horizons mission in 2015 will help unravel these mysteries and are for everyone to enjoy."